When I have a lot going on, I tend to go for lighter reading. Several books I’ve read lately make great beach reads. If you’re looking for some mostly inexpensive books to take to the beach, I recommend books by Karen McQuestion. Other bestselling authors to note of are Jennifer Weiner and Sarah Pekkanen. Karen McQuestion, the author of the bestselling Kindle e-book, A Scattered Life, has a new book out called The Long Way Home. Four women of varying ages embark on a road trip to Las Vegas. Along the way, they face past fears and tragedies, form close bonds, and of course have the adventure of a lifetime. A good author puts you into the circumstances and gives you a full idea of their character’s personalities. McQuestion does a good job of this in The Long Way Home. There is even a supernatural element to the story. Sarah Pekkanen writes classic chick lit, but I enjoyed These Girls more than most chick lit books I’ve read because the characters had real personalities. It also boasts great reviews. They dealt with real issues and showed compassion for each other. There wasn’t a snooty tone to this book like there usually is in a book about working at a magazine. That’s not to say that These Girls doesn’t give insight to the cutthroat nature of the competition for higher jobs within a magazine. Jennifer Weiner is the bestselling author of In Her Shoes. It was developed into a hit movie a few years ago. I think my favorite part about Jennifer Weiner’s books is the humor. Usually she writes from the point of view of a “second best” who give their funny take on another popular, “have it all” type, that doesn’t really have it all. Her latest, Then Came You deals with fertility issues from different perspectives. All of these books are $9.99 or less in the Kindle Store. Karen McQuestion’s book is available in the Kindle Owner’s Lending Library. Happy reading! 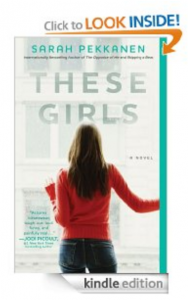 This entry was posted in Good Kindle Books At A Glance and tagged A Scattered Life, Good In Bed, In Her SHoes, Jennifer Weiner, Karen McQuestion, sarah pekkanen, the long way home, then came you, these girls by holly. Bookmark the permalink.